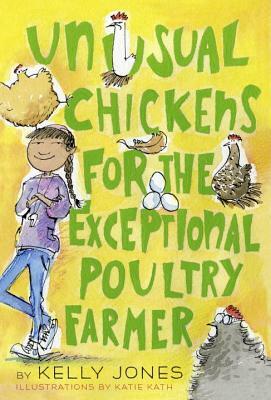 Fans of Polly Horvath or Roald Dahl will love this quirky story of a determined girl, and some extraordinary chickens. And then more of her great-uncle's unusual chickens come home to roost. Determined, resourceful Sophie learns to care for her flock, earning money for chicken feed, collecting eggs. But when a respected local farmer tries to steal them, Sophie must find a way to keep them (and their superpowers) safe. Told in letters to Sophie's abuela, quizzes, a chicken-care correspondence course, to-do lists, and more, Unusual Chickens is a quirky, clucky classic in the making. KELLY JONES has worked as a librarian and a bookseller, and now turns her talents to fiction. Her first book, Unusual Chickens for the Exceptional Poultry Farmer, was an Indies Introduce Pick, an ALA Notable Book, an SLJ Best Book, a Kirkus Reviews Best Book. You can find her at her website: curiosityjones.net, or on Twitter: @curiosityjones. KATIE KATH earned an MFA from the Savannah College of Art and Design and works as a freelance illustrator. You can learn more about her work at ktkath.com.